“I just can’t handle it any more. We’ve tried everything we could think of, and it’s just constantly a weedy, muddy mess that feels like a total waste.” He sounded frantic. Desperate! Hillside landscaping can do that to a person. Those steeply sloped beds seem to want to dump soil and mulch in your backyard, then fill up with every weed from miles around. Those problem areas can become opportunities – you just need to know what the problems are, and how to solve them. Water is the number one foe anyone has when developing a landscape plan for a hill. Water causes erosion, which just means that the soil you need up top ends up down at the bottom. That can lead to unstable slopes, exposed roots, even plants getting washed right down the hill. If you’re just getting started, consider reaching out to your local Virginia Soil & Water Conservation office for more info. This is a before shot from an Arlington landscape design project that we recently completed. As you can see, it’s your typical northern Virginia “let’s shoehorn a big house onto a small lot and any problems will manifest themselves long after we’re gone” scenario. Water was ripping down that side yard, and just in the few months between phase one (lower patio) and phase two (the slope), a LOT of the soil had washed downhill. In another few months, we may have had issues with the driveway getting undermined. Curious what we did? Because the house sits lower than the road, a lot of water comes down the driveway. The asphalt guys pitched the driveway to channel water into the yard, but that left us with a lot to manage. We also had the downspouts to deal with. So, we plumbed the downspouts to come out farther downhill. We also created a basin with a 12”x12” drain that exits in the middle of the stone swale. What stone swale? Keep reading. We knew we would have a lot of water coming down the hill. We also wanted to make sure we weren’t dumping it on the neighbors, because that’s 1) rude and 2) illegal. To channel the water, we built a drainage channel, or swale, using what’s known as gabion stone. Gabion stone is large, angular chunks of stone like what you see along freeways, county road ditches, etc. It’s not as pretty as washed river rock, but it stays where you put it. It also serves to slow the water down. The two primary factors that cause damage on a hillside landscaping project like this are water volume and water velocity. The volume is what it is – that’s determined by how everything grades towards us – but we can reduce the velocity of the stormwater, which makes it much less damaging. By using irregular, angular stone that just out at angles to the flow, we break up the water flow. Had we poured a concrete gutter or done something similar, we’d have the last hill on Splash Mountain. Not so good for erosion control! Small hillside landscaping designs that are located right off a patio and only have a small hill are great. Often, all you need is a short wall, and you can stand in front of the wall and weed and prune and have a beautiful, easy landscape. We call these unicorns because they’re magical creatures that no one *I* know has seen. Instead, most hillsides a nightmare to deal with. Most of the time they start out covered in grass (“because screw you guys,” quoth the homebuilder), and we get called when the homeowner is tired of mowing the Incline of Pain and Fear. We can plant the heck out of a hillside so you don’t need to mow it, but you’re still going to need to get in there occasionally. Low maintenance in this case is a double-pronged campfire weiner fork of awesomeness. Naturally we want plants that are, themselves, low maintenance. Anything you really don’t need to get in and prune is a winner for anyone with a serious hillside to deal with. If we can get plants that will also spread, fill in, and suppress weeds while cutting down on the amount of mulch used over time, that’s a tremendous win. What we use can depend on sun exposure and water availability, but plants like cotoneaster, prostrate junipers, evergreen perennial groundcovers can be a lifesaver. In the above project, you can see that we used a LOT of cotoneaster. It’ll help lock in the mulch and the hillside, and provide a simple yet durable counterpoint to the other plants. Unless you spray an entire hillside with that rubber stuff they use on truck bedliners (would it work? hmmm) you’re still going to have periodic maintenance. It’s called nature – deal with it! You’ll need to prune and shape a few plants, clean up broken branches, pull weeds, and maybe even spray for pests or diseases. You would be amazed how many people design themselves right out of being able to get in their hillside landscaping. Don’t do that! Instead, provide yourself a path with which to get through the planting beds. If a path won’t work, at least give yourself “landing pads” so you can get from one end to the other. Consider it a little ninja warrior training. It’s a common sight all over the country: from the back of the house, the lawn extends back towards the property line for 15-20 feet, and then shoots up at a stupid angle for the rest of the distance to the end of the lot. This causes homeowners to scratch their heads and wonder what the heck to do with this wasted space. I’m a huge fan of reclaiming the “useless” spaces in the landscape. A lot of those collections of wasted square footage get a new life as utility areas, or small little focal point spots. If your backyard has an unused area at the top of the slope, you have a gift. Think about it: it’s probably tucked a little out of sight. It’s probably weirdly shaped. Your guests don’t go there. Heck, your partner probably never goes there. *whispers* it’s all yours now. You don’t have to share. Seriously. If you’re a plant geek and you can’t stop collecting weird hosta and hellebore varieties? It’s your collection garden. If you love pink flamingos and can’t have too many? It’s your museum. Heck, if you’re 67 years old and you want a sandbox, give yourself a damn sandbox. You deserve it! It’s ok, I won’t judge. Because there’s no mountain goat DNA in my family tree, I find running up and down steep slopes to be kind of challenging. Wet slopes can get downright treacherous. If you’re going to be accessing something either above or below a hillside landscape bed with any frequency, you should put in steps. Those steps can be whatever fits your budget and your style. These steps shown above are Tech-Bloc Rocka steps. They’re super easy to place if you have equipment or a couple of strong laborers. These steps are on that Arlington job we mentioned earlier, and they’re made from 6×6 pressure treated timbers spiked together. Here you see another application for Techo-Bloc Rocka steps, only this is a much more formal and constructed path to the backyard. 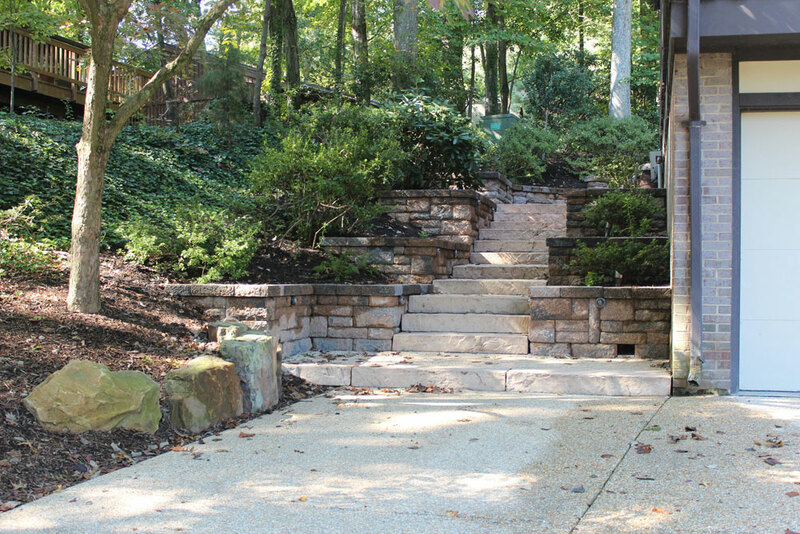 And, of course, if your style is super informal and natural-looking, you can use natural fieldstone steps. Whatever you decide, make sure that the steps are solid, stable, and safe. 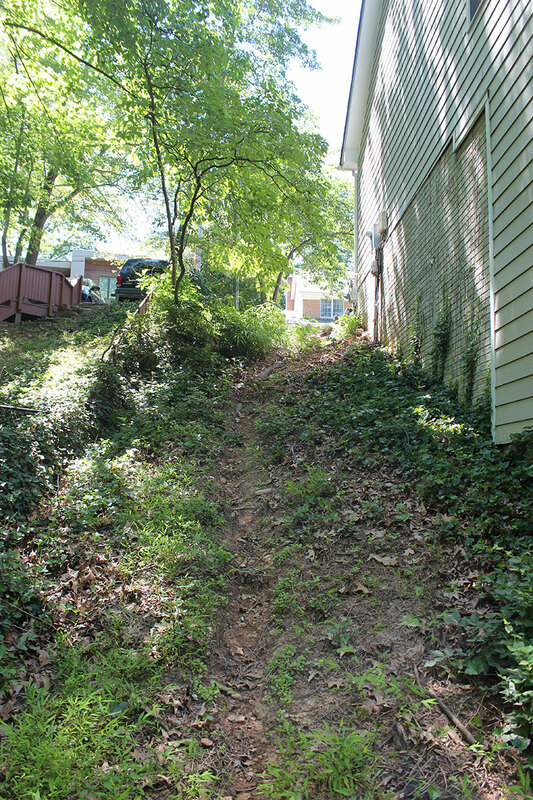 So many articles about making hillside landscaping that works focus on just dealing with the hillside. It’s something to manage, to force into something that can be dealt with, so we can focus our attention elsewhere. What if we made it all about the hill? Here’s a landscape design project we did in Bethesda. The backyard is exactly what I described previously, a short flat spot just outside the back door that shoots way uphill. Well, what makes so many water features look unnatural? The fact that the water source looks really contrived. What if it was built into the side of a big hill so it looked like a natural spring? 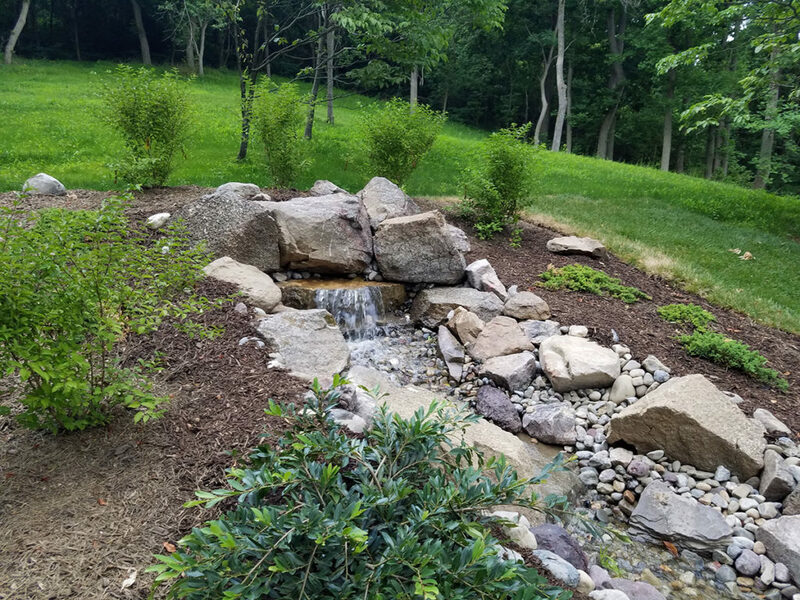 With this Sperryville landscape design project, you can see that we really took the “natural spring” idea to heart. One weekend I took the excavator up on the mountain and found a couple of large boulders. These were arranged so it looked like the water was coming out of a fissure in the rock of the hillside. Landscape lighting can be the final, crowning touch in any hillside landscaping project, but especially ones where the hill itself is the star. Do you have a hillside landscape that you just can’t seem to wrap your head around? Contact us today for a consultation, because friends don’t let friends have boring landscapes!